Current multi-CMA nominee and ACM Awards Male Vocalist of the Year Thomas Rhett is responding to the overwhelming demand for his "forward thinking" (Sioux City Journal) live show, announcing his headlining LIFE CHANGES TOUR 2018 set to hit 30 cities. 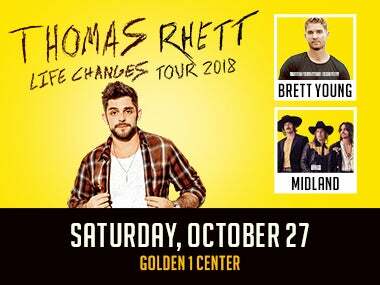 The tour includes a stop at Golden 1 Center in Sacramento on Saturday, October 27. Tickets for this show are $88.31, $68.31, $53.31 and $33.31 for reserved seats and $88.31 for general admission pit plus applicable charges. Tickets go on sale Friday, April 6 at 10am at LiveNation.com. Live Nation is the tour's official promoter and Citi® is the official pre-sale credit card. As such, Citi® cardmembers will have access to purchase pre-sale tickets beginning Tuesday, April 3 at 10am prior to the general public on sale through Citi's Private Pass® program. Additional ticket information is available at www.ThomasRhett.com. The announcement comes as his debut headlining HOME TEAM TOUR, "one of the best Country concerts of the year" (Peoria Star Journal), marks 27 sold out shows so far this year. The "standout" (Billboard) multi-PLATINUM artist will bring his "commanding stage presence" (Rolling Stone) to fans across the country next April with CMA New Artist of the Year nominee Brett Young and Midland. "Headlining for the first time has been pretty unreal," said Thomas Rhett who launched his first headline arena tour in 2017. "It's wild to me that next year we will be launching our second year of headline shows and are bringing out some of my favorite artists in music right now. I think the fans have come to expect that we're going to be on our feet and having the time of our lives every single night."